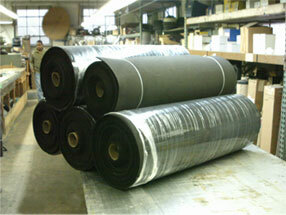 Our inventory of rubber sheets is the most diverse in the industry. This diversity allows us to offer our customers unique and quick solutions for their specified requirements. Most of our sheet rubber is available in thicknesses of 1/64" THK up to 1" THK and in widths of 36", 48" & 72" Wide. Some compounds are available up to 4" THK. Durometers range from 20-90 on the Shore A scale. All Sheet Rubber is sold in full rolls or by the foot. Special requirements are available such as tight tolerances on the thickness, special widths and lengths, matte finish and talc free for adhesive applications. We can supply a variety of rubber and gasketing materials stripped to your specific thicknesses and widths. We can also supply stripped material with PSA (Adhesive Backing) applied to one or two sides for ease of installation. We can provide standard square, rectangular or round extrusions, or we can produce custom profiles such as U-Channel, D-Shape, P-Shape, Tadpole, and T-Shape to name a few. Extrusions are available in solid or sponge form We can also splice the extruded rubber profiles into Gaskets, O-Rings and Seals to your specifications. Sleeves (boots or tubes) are used as dredge sleeves, cement boots, or as flexible connections in discharge applications, They can be made by cutting them from extruded tubing, mandrel wrapped tubing or vulcanized from stripped rubber material. Gerard Packing can provide custom molded rubber products from all types of rubber compounds such as: bumpers, grommets, O-rings, seals, sheet rubber, and vibration mounts. We will quote minimum quantities or large production runs. Please provide a blueprint, specified drawing or personalized sketch and we will provide you a rapid response quotation with your delivery requirement.